Roger Calkins (center) and the Fabulous Silver Tones at the original Soc Hop. If it was not the Kansas City area’s earliest and most consequential rock club, The Soc Hop was certainly one of them. The owners of the original Soc Hop had these business cards with maps made. It was the creation of brothers-in-law Mike Weaver and Ed Bowers, who saw it as both a money-making opportunity and a place for their seven teenage children and their peers to have some fun. They transformed the barn into a club that packed in teens by the hundreds to dance to the blues-rockin’ house band, Roger Calkins and the Fabulous Silver Tones. The barn's last incarnation -- a restaurant. The fun at 95th and Metcalf lasted just two years, however. The Soc Hop predated the city of Overland Park, having gained a two-year operating permit from Mission Township. OP denied them renewal in 1961. The partners didn’t miss a beat, though, turning the former Silver Spur Country Club at 8940 Quivira Road in Lenexa into a new Soc Hop by the summer of 1962. The new Soc Hop opened in Lenexa in 1962. Based around a swimming pool complex, the new Soc Hop also contained a barn-like auditorium with a stage and wooden dance floor, plus an outdoor stage. The crowds followed the proprietors to the new Soc Hop, but so did some of the problems with crowd control. That and a broken filtration system that closed the pool during the summer of 1963 spelled doom for the second Soc Hop after just two seasons. The place had once last hurrah when auto salesman Clair Beeman reopened it in 1967 as COYAS Castle. COYAS was an acronym for Club of Young Americans. But again, the club lasted only a couple of seasons. So, did you attend a dance at The Soc Hop or COYAS Castle? What bands did you see? What was it like? Please leave a comment below. “HIGH” HELLO! WOW! I JUST NOW FOUND YOUR SITE! GOD WORK’S IN MAGICAL-MUSICAL WAYS! I WOULD LOVE TO HEAR FROM U- SAY HIGH TO MICHAEL WEAVER – FRANK-RICH-JOE-& EVERYONE IN K.C.!!!!!!!!! PEACE-LOVE&-ROCK ON! The Soc Hop was the place where Blues and R&B spread to the white teenage community, and spawned many furure musicians, such as myself, Danny Gregory, Beechie Biondo, Johnny Isom, Andy Kinne, The Organ Bros. and many many more. Thnaks for the great memories. I saw many bands local and national at the last Soc hop and coyas castle…. The Chessman, Chantays, Fabulous flippers, Blue Things, and outside I saw the Syndicate of Sound around the last part… also played once at the Peppermint barn out back around late 60’s I seem to remember it becoming the “water hole” for the last go around….Many Great Friday nights spent there with all my Friends from SMW….Thanks for the site…. My older sister, Caren, took me to the Soc Hop to see Roger Calkins and The Fabulous Silver Tones. It was a life changer! The cool soulful sounds of early rock & roll. It was really Rockabilly, a window into another world. Night creatures with a hint of violence. This was before the ‘All You Need Is Love’ era. It planted a live music seed that is still blooming in my heart. Great site. I used to play at Coya’s Castle with Bobby Goodwin and the Chontels regularly, what great memories. I also remember seeing Roger Calkins, The Blue Things, and other great local bands. It was so much fun I’m still doing the same thing almost 50 years later. I remember the Chontels – assuming it’s the same band. I remember a left-handed guitatist and a drummer named Nick something. Saw The Kingmen and Mitch Ryder if I’m not mistaken at the Peppermint Barn at Coya’s Castle. This was like 67-69, somewhere in that time frame. When this closed everyone went to some other barn-converted site somewhere in Wyandotte Co., can’t remember where now. One of the favorite bands there was The Bobby Soul show. The year, 1962-63. Use to hang out at the Soc Hop and Coyal’s Castle! I remember Herb Copeman, Bobby Joe Gilotta, Clement & Jessee Maciel, Bob Nortfleet, John Lascon, the Haywood Twins, Mike Swanson, Charley “Potatoes” Hawver, & the rest of us! I remember Roger Calkins, Little Danny Gregory, along with Gary Mac & the Mac Truques. Even have their 1968 record album, “Alive in concert. Saw them with Beechie Biondo on drums, Dani Gregory, Tim Ballard, Bud Haney, Ray Bagby and Garry Mac perform in Las Vegas! Those were the best years in our lives!! Ok guys bring back the memories. I remember Hyway Simone’s place on 40 hwy Sunday nights. Lots of bands played there. Think it burned down. Inferno Lounge on Troost had a lot of bands play there. Tom and Ed Gavin use to play in a lot of bands in KC/ Tom played the drums and Ed. played the base guitar. How about Little Willie and the Hideaways. Lots of dances CYC on Sundays. I think Hyway Simone had a place on Broadway too about from 32nd to 39th. Ed. played with Beechie a lot too plus Dani Gregory, Gary Mac. Chuck and Chad Haywood, Bobby Joe. We had the best time growing up with music. Best music to listen to and dance too. How lucky huh. We would go up to Gavins and listen to the guys practice they lived right up the street from us. Just stumbled on this site. I was married to Tim Ballard long ago. We dated 1964-1967, married 1967-1977. I remember all of those bands. Tim was once a part of The Classmen while he was at Van Horn HS, then had bands of his own, one of which was The 50 Foot Hose. Beechie Biondo was his drummer through a couple of those years. They played all around K.C., including Your Place in Shawnee Mission west of The Plaza, the Boom Boom Room above the Club Royale, The Attic, and Lakeside Ballroom, all of this before he joined The Mac Tuque. We were in the road all over the U.S for 3 years until the group broke up. He cintinued his music, moved to Ok City, had a nightclub The RazzmaTazz for at least 4 years, then he went back on the road. We divorced. But he moved in to Dallas, owned a jazz club there for a few years, then moved on to Las Vegas where he entertained in many clubs for 12 years. His health became an issue, so he and current wife moved back to Dallas so he could go for cancer treatments at MD Andersen in Texas. After 8 years battling throat cancer and later lung cancer he passed away June 8, 2009. For anyone interested in obtaining any of his recorded music, contact daughter Kathryn Ballard Shut. Their company known as TimKat Entertainment is carried on by Katy. She also is an active musician, songwriter and more. http://about.me/timkatent. Enjoy music. Just remembered, Tim Ballard went with The Mac Truque in late 1967 replacing saxaphonist Rich Gordon. Tim also played trumpet, and sang. During that time they recorded their album Truqued Up with Capital Records. They played at The Inferno many times in K.C.as well as one in Waldo named The Combo Club. Another fun place on Sundays was The Chicken Ccop in Raytown. Michael Weakley will you contact me? I want to interview you for my 60’s record blog site! Located this site trying to find our old drummer, Beechie Biondo. I’m so glad Frank Gonzalez mentioned him in his comment. Likewise, I remember Gary Mac and the group, Danny Gregory and the others. I was sorry to hear about Tim Ballard. We backed him once. Our group was Rich and the RobRoys and The Establishment. I found our old keyboard player, Steve Friedson who went with the Kingsmen but does anybody know about (Anthony) Beechie? Wish I could help out trying to locate Beechie Biondo. I don’t live in Kansas City any longer, but I can make a few calls to see where Beechie may be. Last I heard about him was in 1969. We both were dating the same Playmate bunny name Vicky Champ. I list contact with her as well in 1970, after I moved to Castle Riyal Apts on 44th Street, off Southwest Trafficway, with Dave Cirroto, who opened up Freedom Palace (the old Pla-mor bowling alley) on 31st street. Dave moved to California, after being roommates for about a year. Dale Dewey was our 3rd roommate. I believe Dale, passed away in the mid-late 90’s. Wish I had more info on Beechie, but I don’t. I know he was friends with a guy name, Sam Blondo, nephew of Carl Blondo. I may be able to contact Carl. Another friend was Bobby Joe Gilotta and Herb Copeman. Bobby Joe passed a few years ago and I list contact with Herb, after I moved to Miami, in 1972. If I find out any good info, I’ll post it later. I also want to see if anyone remembers Frank Plas, who performed with Roger Calkins and the Fabulous Silvertones. Hail to the Soc Hop and Coya’s Castle! See Ya all later, my friends. Frankie G.
i played Coya’s Castle in 66 or 67 with The Changin Times, a band composed of guys from Platte City. Tommy Bartlett, who played drums, went on to play with Stoneface, Jeff Gholson’s band after The Emeralds (I played bass summer of 68 in that band, I am proud to say). John Gresham played lead guitar — he had a red 335 like a lot of players at the time. Dave Parrett, who I believe passed away, played an EB0. Changin Times followed the Chessmen on the Sat AM channel 4 dance show “The Happening.” We alternated with the Chontels (Mike Wagonner’s band), as I recall. That band became LD Sands and the 19th Century Sound Affair after the Buffalo Springfield and country rock came on the scene. LD (Larry) went on to start Optical Shops of Aspen– he did well. I think Mike W stayed in the music business– tour managed Black Oak Arkansas. But that’s ancient history. In the ’60s I was in The Blue Velvets band. In the ’70s we changed our name to Reflections. 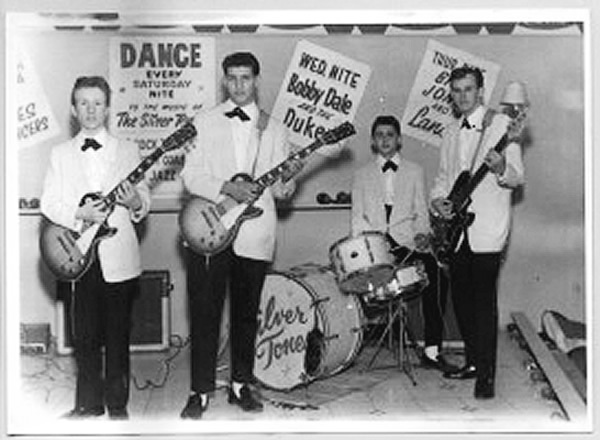 Frank Plas of The Fabulous Silvertones was my personal guitar idol even before I owned a guitar. They were inducted into the ( http://ksmusichalloffame.org/ ) in 2007. My historical band site ( http://www.dansher.com/banddays.htm ) has a fair amount of information about the Silvertones, including links to three downloadable .mp3 files of their recordings. The awesome Midnight Thunder is among them. About 2011 I was back in the Kansas City area (I live 30 min N of Denver now) and was able to visit with Frank Plas at his home. We jammed a few tunes together which was a dream come true for me. Stupidly I did not get any contact information for him then. I grew up just a couple of blocks from the Organ Brothers, Danny and Billie. Billie gave me drum lessons around 1965. In my opinion there was no better band in the KC area than Danny And The Roulettes…with Dani Gregory doing vocals, Gary Mac playin lead, Danny Organ on Bass, Rich Gordon blowin sax, first Billie on drums then Ray Bagby on drums there just was no other blue eyed soul band that could compete. Around that same time I thought The Emeralds were first class too! At Coyas around ’67, ’68, Bobby Soul, also The Royal Coachmen were kickin it real good. Man that was the place for girls! We had a regular crew every weekend.., myself, Ronnie Silverman, Tommy Giambroni, Frank Tutera, Sammy Corsentino, Joe Digiovanni, Bob Gold , Eddie Martin…great times! Wow…I just found this site as I was looking to find out when the Lakeside Ballroom burned down. I was the drummer with the Bobby Soule Group when it burned down and all of our equipment (except Carl Cleveland’s Hammond B3) was destroyed. We all bought new equipment but we never saw a dime of insurance money so it was a huge issue with us. Now that I have read all the posts I am blown away with all the history. I recall all of the places mentioned and most of the people. I agree that Danny and the Roulettes or Gary Mac and the Mac Truque were the class of the era, but The Flippers were the best. I know I loved to watch Bagby play the drums. The original Bobby Soule Group had myself on drums, Bobby Culbertson (Bobby Soule) as lead singer and trumpet, Buddy Haney on guitar and trumpet, Ron Coleman on sax, Carl Cleveland on organ and guitar, and Jimmy Hamilton on bass. When Buddy Haney left we added Alan Tucker on guitar and we he died we added Eddie Gavin on guitar. We played most all of the places mentioned here including Coya’s, Lakeside Ballroom, The Inferno, 7500 Club, the Boom Boom Room and many more. We opened the show at Shawnee Mission South for The Who and the Buckingham’s and that has some strange memories…(The Who were jerks). We played with the Esquires (Get on Up), The Outsiders (Time won’t Let Me), Bob Kuban and the InMen (The Cheater). I recall Frank Plas, Danny Gregory, Gary Mac, Roger Calkins, Tim Ballard, Larry Watson, Leo Costanza, Bob Owens, I guess I should stop…So, does anyone know when Lakeside burned down? I first heard Roger play at the “Fandango Clue” on 26th and Troost in the 60’s. Today is Wednesday, October 5, 2016….I wanted to share with you all, and update what I know about the Soc Hop experiences and about the Fabulous Silvertones. Lil Joe Sherrick, Frank Plas, Dani Gregory and Beechie Biondo, are all still doing well…for our ages! I had lunch with Joe Herrick today, along with an old buddy, Clement Maciel. I flew in from Atlanta, for a 12 day stay! I wish we could get Frank Plas, Beechie Biondo and Dani Gregory together for a jam session! I haven’t heard from Sam Blondo and the other “Fellas” for quite some time. I have talked to his uncle, Carl Blondo a few months ago tho. Joe Sherrick, Clement Maciel and I are getting together again Monday, October 10th. I believe Joe is going to try to bring in Mike Weaver too. Heck, we might as well try to contact and invite Beechie and Frank …maybe Dani too, if we can. Anyway, I’m having a great time reminiscing about our old Soc Hop and Coya Castle days. The Haywood twins are alive and doing well. You can reach me at 404 626 7849. Hope we’re around for another decade! Thanks for listening! Ciao! RIP Roger! I remember seeing the Kingsmen ( Louie Louie ) at coyas castle I believe Summer of 1967 …The drummer was wearing black chuck Taylor high tops… so cool! The first of many many concerts still love live music it’s the BEST! The band Friar Tuck and the Monks, 2008 inductees to the Kansas Music Hall of Fame, played Coya’s Castle several times in the late 60’s. Lots of fun. Great memories. My best friend and I collected soda bottles to get money to go to Coyas Castle in 66-67. Saw The Buckinghams and Melissa Manchester there. Danced and enjoyed local bands. “In The Midnight Hour” and “Mickey’s Monkey” were our favorite songs, What memories! It was also my escape from a dismal and isolated home life and gave me something to look forward to. Did Coya’s Castle get renamed to Johnson County Recreation Center? I also remember seeing The Byrds there but I could be wrong. Am I? Johnson, Randy Poletis here saw your post was with LL City yes 13 years left in 2008. Just a Street Guy from the Dott back in the day.. Knuckleheads now my kinda place…and Little Joe is there. Looking for some one who remembers Spanky & The Upsetters I thought they were good and Spanky was a gas with his dancing… last time saw them Lakeside Brawlroom …Lol what great groups named here…! !